Mission Specialists Patrick Forrester and Steven Swanson will continue to activate the International Space Station’s new truss segment during STS-117’s fourth spacewalk. The astronauts are scheduled to begin the six-hour spacewalk at 12:53 p.m. EDT today. The STS-117 crew installed the Starboard 3 and 4 (S3/S4) truss segment onto the station on June 11. The spacewalkers will check out the Drive Lock Assembly 2, one of two mechanisms that will drive rotation of the S3/S4 Truss Solar Alpha Rotary Joint (SARJ). They will remove the final launch restraints on the SARJ. The spacewalkers will also remove a keel pin and drag link from S3. Other tasks scheduled for the spacewalk include the installation of a computer network cable onto the Unity module and the removal of a Global Positioning System antenna. The duo is also slated to complete the installation of a piece of debris shielding on the Destiny laboratory. Forrester and Swanson conducted STS-117’s second spacewalk. 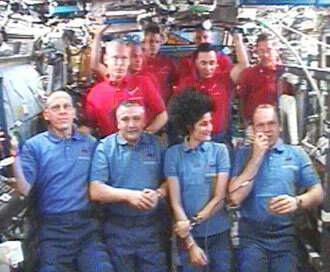 Mission Specialists Jim Reilly and Danny Olivas conducted the other two. Today’s excursion will be the 88th spacewalk devoted to station assembly and maintenance. In a continuing improvement of the onboard Russian computer system, all six channels are now operating in the two Russian command-and-control and the guidance-and-navigation computers that stopped operating three days ago. Yesterday, station Commander Fyodor Yurchikhin and Flight Engineer Oleg Kotov were able to reenable four of the six channels in the computer systems after bypassing what appears to be a faulty power switch with external cabling. The Russian cosmonauts repeated that same modification today on the last two channels, which were originally suspected to have failed. They are continuing to checkout and troubleshoot the computers. Meanwhile, the forward plan is to keep the original four channels active and keep the other two channels in “stand by” mode. 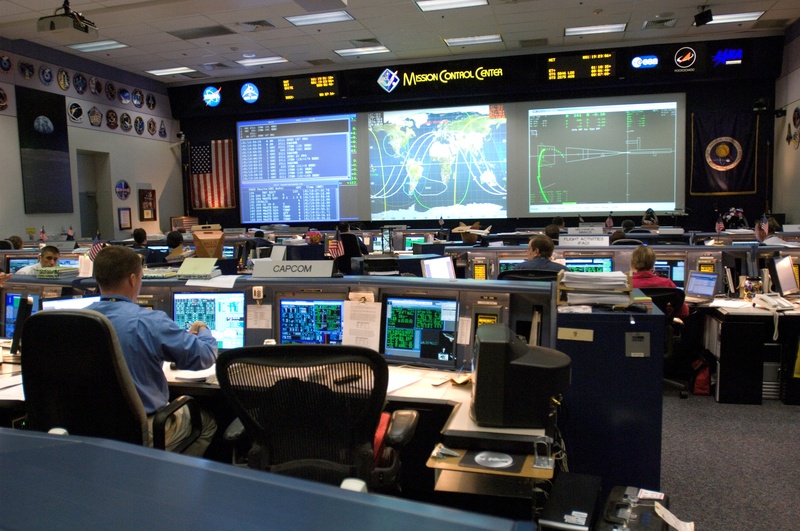 Engineering teams also plan to test the Russian attitude control system as early as Sunday morning, in order to confirm that it is operating and working well in concert with the U.S. system. The specifics of the test are still being defined but once executed, the teams will determine when shuttle Atlantis will depart the station. Undocking is currently scheduled for Tuesday morning. Onboard, the rest of the crew today focused on transfer activities as well as preparations for a fourth spacewalk tomorrow. The ten astronauts, including Expedition 15 Flight Engineer Clay Anderson, and shuttle Commander Rick Sturckow, Pilot Lee Archambault, and mission specialists Pat Forrester, Steven Swanson, Danny Olivas, Jim Reilly and Sunita Williams, also participated in a joint crew news conference. During their crew sleep, Williams established a new record for the longest single spaceflight by a female. At 12:47 a.m. CDT, Williams surpassed the longstanding 188 day and 4 hour record set by astronaut Shannon Lucid at the Mir space station in 1996. The four spacewalkers spent time working on the U.S. spacesuits. Olivas and Reilly finished their post-spacewalk spacesuit reconfiguration tasks, while Forrester and Swanson configured their suits and tools for their second spacewalk. The final spacewalk of the flight is set to begin Sunday morning at 11:33 a.m. CDT. The spacewalk will include a few wrap up tasks associated with the new truss segment, including installation of the Drive Lock Assembly 2, which with a second DLA, drives rotation of the S3/S4 Truss Solar Alpha Rotary Joint. The spacewalkers also will remove the final six launch restraints on the SARJ to enable its rotation and remove a keel pin and drag link from S3. They’ll also complete installation of a debris shield on the Destiny laboratory, install a computer network cable on Unity and remove a Global Positioning System antenna.